Designed with the rigors of international touring in mind, the Martin RoboColor Pro 400 is utilized in a wide variety of lighting applications. It is a tough, durable and versatile color changer. It is a brighter, more flexible and more cost effective alternative to the parcan. Housing two dichroic color wheels, the Martin Robocolor Pro 400 can generate 32 intense colors and hues. The smooth microstepping and ultra-fast shutter doubles as both a full-range dimmer and a highly effective strobe to provide added energy. A system of built-in and optional lenses allows for a field angle range from 5° up to 33°. 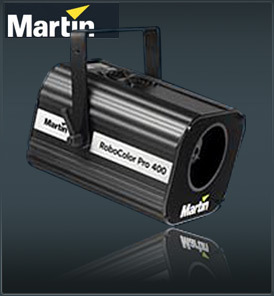 The Martin Robocolor Pro 400 houses a powerful and long lasting light source - a 200W MSD lamp providing 2000 hours of reliable operation. Control comes via a Martin RS-485 or DMX 512 controller and stand-alone operation can be either automatic or sound triggered. The RoboColor Pro 400 can also be used as a light source for fiber optic cable when fitted with an optional adapter.